Beta testing is fundamentally all about the testing of a product performed by real users in a real environment. There are many tags we use to refer to the testing of similar characteristics, such as User Acceptance Testing (UAT), Customer Acceptance Testing (CAT), Customer Validation, and Field Testing (more popular in Europe). Whichever tag we use for these testing cases, the basic components are more or less the same. To discover and fix potential issues, this involves the user and front-end user interface (UI) testing, as well as the user experience (UX) related testing. This always happens in the iteration of the software development lifecycle (SDLC) where the idea has transformed into design and has passed the development phases, while the unit and integration testing has already been completed. 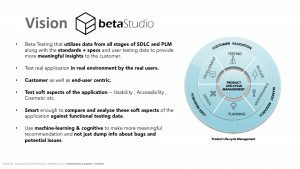 The beta stage in the product lifecycle management (PLM) is the ideal opportunity to hear from the target market and to plan for the road ahead. As we zoom into this phase of testing it has a board spectrum of ranges. On one side is the Front-End or UI related testing involving UI functionality (Cosmetic, UI level Interaction and Visual look and feel). At the other end is the User Experience (UX), including user testing involving more from A/B (split) testing, hypothesis, user behavior tracking and analysis, heat maps, user flows and segment preference study or exploratory testing and feedback loops. Beta testing relies on the popular belief that goodness will prevail, which defines the typical tools that carry out such tests. Examples are the shortening of beta cycles, reducing the time investment, increasing tester participation, improving the feedback loop and visibility, etc. 1. 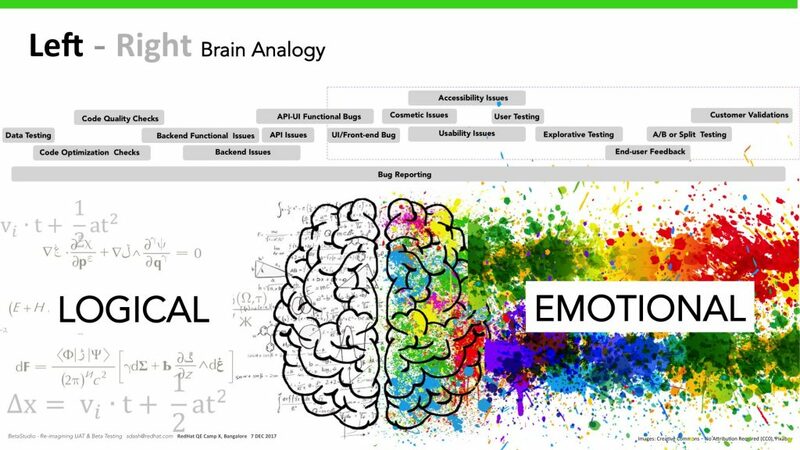 Left-right brain analogy, which points to the overlap between humans and technology. The typical belief is that the left-hand side of the brain mostly processes the logical thinking, while the right-hand side is more about the emotional thinking. Based on this popular analogy, when we map the different aspects involved in different stages of SDLC for a digital product across a straight line from left to right (refer to the diagram below), we will notice the logical and more human-centered aspects are divided by an imaginary line from the center. 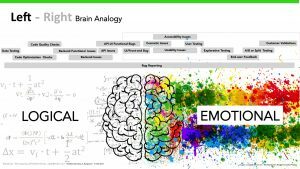 We will also notice the gradual progression of the emotional index for the components from left to right. When we map these to the beta testing phase, we notice these right-hand components are predominant. 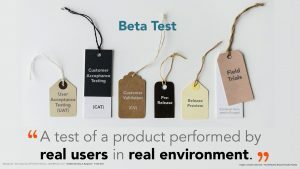 As users of the products (like humans), we are more emotionally connected to such aspects of the product, which are validated or verified in a beta test. This makes beta testing one of the most important testing phases in any SDLC. Another interesting point to note is that when we look from the traditional software approach to define “criticality”, the areas that are tested during user acceptance testing (UAT / Beta), mostly fall into Class 3 and 4 type of criticality. But because these touch the core human aspects, they become more important. This Youtube video (Boy Receives Enchroma Glasses From Father) helps to illustrate the importance of technology touching the human emotions. It was posted by a popular brand of glasses to demonstrate how they can correct colorblindness in real time for the end user. Interestingly, this is an aspect of “accessibility”, which is typically covered during a beta test. Considering this video, the aspect of accessibility naturally raises the question about what we can do for this father and son as a tester, as a developer, or as a designer? And when we look at the stats, we find that the number of people the accessibility impacts is huge. One in every five people is challenged by some kind of disability. And unfortunately, some reports indicate that a majority of websites do not conform to the World Wide Web contortion’s (W3C) accessibility guidelines (in 2011 almost 98% of websites failed the W3C’s accessibility guideline). This helps to demonstrate the human angle, which advocates why beta testing is important to ensure these aspects are validated and verified to ensure the target user needs are completely met. 2. A second reason for advocating the importance of beta testing is evaluating it from the international standards perspective (ISO/IEC 9126-4). This helps to define the difference between usability and quality. 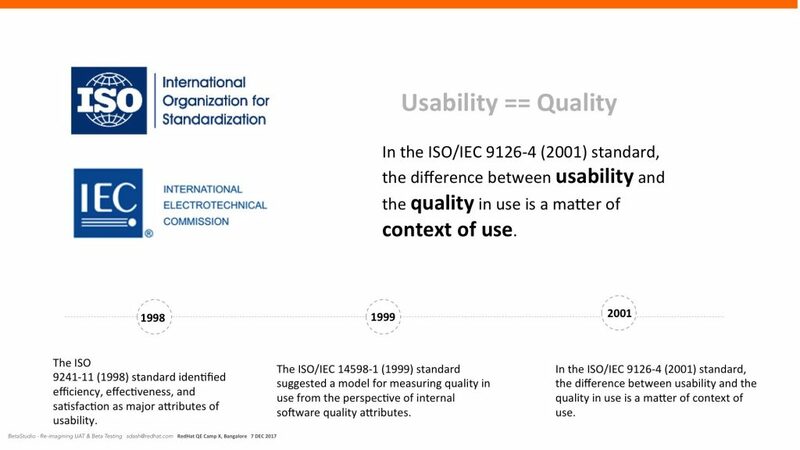 The International Standards Organization (ISO) has been focused on the standards around quality versus usability over time. In 1998 ISO identified efficiency, effectiveness and satisfaction as major attributes of usability. In 1999 a quality model was proposed, involving an approach to measure quality in terms of software quality and external factors. In 2001 the ISO/IEC 9126-4 standard suggested that the difference between usability and the quality in use is a matter of context of use. ISO/IEC 9126-4 also distinguished external quality versus internal quality and defined related metrics. Metrics for external quality can be obtained only by executing the software product in the system environment for which the product is intended. quality process is incomplete. The context referred to here is fundamental to a beta test where you have real users in a real environment, thereby making the case of the beta test stronger. Now that we know why beta testing is so very critical, let’s explore the challenges that are involved with a beta stage. Any time standards are included, including ISO/IEC 9126, most of these models are static and none of them accurately describe the relationship between phases in the product development cycle and appropriate usability measures at specific project milestones. Any standard also provides relatively few guidelines about how to interpret scores from specific usability metrics. And specific to usability as a quality factor, it is worth noting that usability is that aspect of quality where the metrics have to be interpreted. 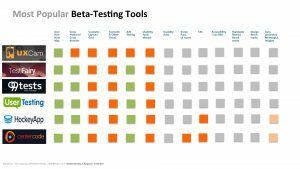 When we look at popular beta-testing tools of today, the top beta testing tools leave the interpretation to the customer or to the end-user’s discretion. This highlights our number one challenge in beta testing, which is how to filter out pure perception from the actual and valid issues and concerns brought forward. As most of the issues are related to user testing (split testing and front-end testing), there is no optimized single window solution that is smart enough to handle this in an effective manner. Real users in the real environment are handicapped to comprehend all the aspects of beta testing and properly react. It’s all a matter of perspective and all of them cannot be validated with real data from benchmarks or standards. 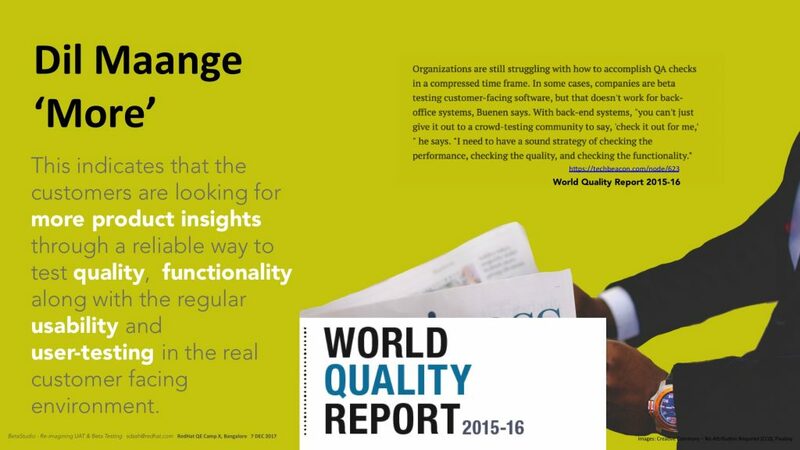 The World Quality Report in 2015-16 Edition indicated that expectations from Beta testing is changing dramatically. It hinted that the customers are looking for more product insights through a reliable way to test quality and functionality, along with the regular usability and user testing in real customer facing environment. It’s not only the Beta Testing, but more user-demand is also impacted by the rising complexities and challenges due to accelerated changes in the technology, development, and delivery mechanisms. The 2017-18 World Quality Report states that the test environment and test data continue to be an achilles heel for QA and Testing. The challenges with testing in agile development are also increasing. There is now a demand for automation, mobility, and ubiquity, along with smartness to be implemented in the software quality testing. Many believe that the analytics-based automation solutions would be the first step in transforming to smarter QA and smarter test automation. While this true for overall QA and testing, this is also true for Beta Testing, which deals with the functional aspect of the product. Let’s see where we stand today. If we explore popular beta testing solutions, we will get a big vacuum in the area where we try to benchmark the user’s need for more functional aspects, along with the usability and user testing aspects. Also, you can notice in the diagram below that there is ample space to play around with the smart testing scenario with the use of cognitive, automation, and machine learning. 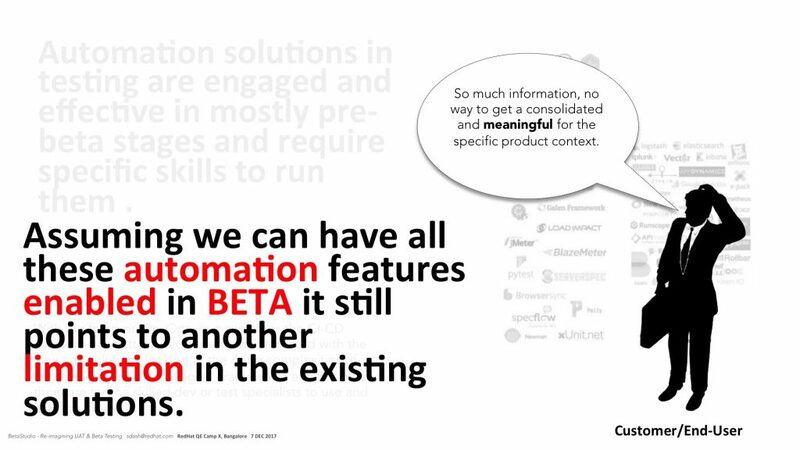 Basically, we lack “smartness” and proper “automation” in Beta Testing Solutions. Apart from all these, there are some more challenges that we can notice if we start evaluating the user needs from the corresponding persona’s viewpoint. For example, even when assuming that the functional aspect is to be validated, the end-user or the customer may have an inability to recognize it. 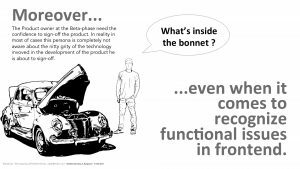 The product owner, customer, or end-user are part of the user segment who may not be aware of the nuts and bolts of the technology involved in the development of the product they are testing to sign it off. It’s like the classic example of a customer who is about to buy a second-hand car and inspects the vehicle before making the payment. In most of the cases, he is paying the money without being able to recognize “What’s inside the bonnet!”. This is the ultimate use-case that advocates to “empower the customer”. So, how do we empower the end user or the customer? The tools should support that in a way so that the user can have his own peace of mind while validating the product. Unfortunately, many small tools which try to solve some of those little issues to empower the user are scattered (example: Google Chrome extension that helps to analyze CSS and creates the report or an on-screen ruler that the user can use to check alignment, etc.). The ground reality is that there is no single-window extension/widgets based solution available. Also, not all widgets are connected. And those which are available, not all are comprehensible to the customer/end-user as almost all of them are either developer or tester centric. They are not meant for the customer without any special skills! When we look at the automation solutions in testing as part of much Continous Integration (CI) and Continuous Delivery (CD), they are engaged and effective in mostly “pre-beta” stage of SDLC. Also, they require specific skills to run them. With the focus on DevOps, in many cases, the CI-CD solutions are getting developed and integrated with the new age solutions looking at the rising complexities of technology stacks, languages, frameworks, etc.. But most of them are for the skilled dev or test specialists to use and execute them. 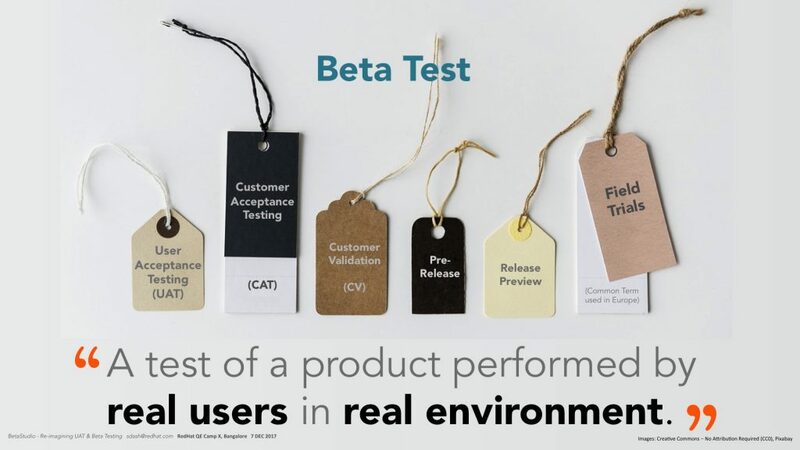 And this is something that does not translate well when it comes to Beta testing where the end-user or the customer or the “real user in real environment” are involved. Assuming we can have all these automation features enabled in BETA, it still points to another limitation in the existing solutions. It’s because the employment of automation brings in its own challenge of “information explosion”, where the end user needs to deal with the higher volume of data from automation. With so much information, the user will struggle to get a consolidated and meaningful insight of the specific product context. So what do we need to solve these challenges? Here is my view — we need smart, connected, single window beta testing solutions with automation that can be comprehensible to the end-users in a real environment without the help of the geeks. 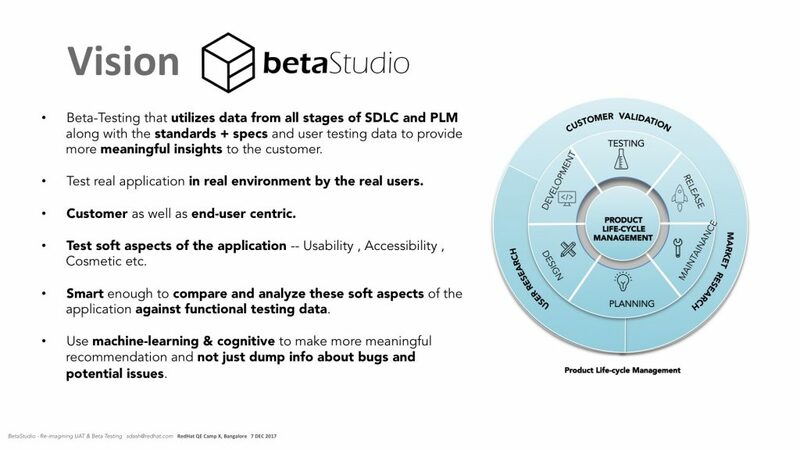 For sometime since a last few years, I have been exploring these aspects for the ideal beta testing solution and was working on the model and a proof of concept called “Beta Studio”, representing the ideal beta testing solution, which should have all these — Beta-Testing that utilizes data from all stages of SDLC and PLM along with the standards + specs and user testing data to provide more meaningful insights to the customer. Test real applications in real environments by the real users. Customer as well as end-user centric. Test soft aspects of the application — Usability, Accessibility, Cosmetic, etc.. Be smart enough to compare and analyze these soft aspects of the application against functional testing data. 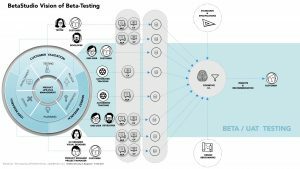 Mostly this vision of the ideal beta testing solution touches upon all the aspects we just discussed. It also touches upon all the interaction points of the different personas; e.g. customer, end-user, developer, tester, product owner, project manager, support engineer, etc.. It should cover the entire Product Life Cycle and utilize automation along with the machine learning components such as Computer Vision (CV) and Natural Language Processing (NLP). Then gathering this information to be processed by the cognitive aspect to generate the desired insights about the product and recommendations. 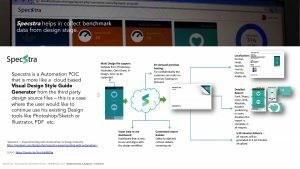 During this process, the system will involve data from standards and specs along with the design benchmark generated from the inputs at the design phase of the SDLC, so that meaningful insights can be generated. In order to see this vision translated into reality, what do we need? The following diagram hints about the six steps we need to take. First we should create the design benchmark from the information at the design stage that can be used in comparing the product features against metrics based on this design benchmark. Then automate and perform manual tracking of the product during runtime in real time and then categorize and collate this data. This involves creating features to support the user feedback cycle and user testing aspects (exploratory, split testing capabilities). Collect all standards and specifications on different aspects — e.g. Web Content Accessibility Guideline (WCAG) Section 508, Web Accessibility Initiative Specs ARIA, Design Principles, W3C Compliance, JS Standards, CSS Standards & Grids, Code Optimization Metrics Error codes & Specs, Device Specific Guidelines (e.g. Apple Human Interface Guideline) etc. Build the critical components such as Computer Vision and Natural Language Processing units which would process all the data collected in all these stages and generate the desired metrics and inferences. Build the unit to generate the model to map the data and compare against the metrics. 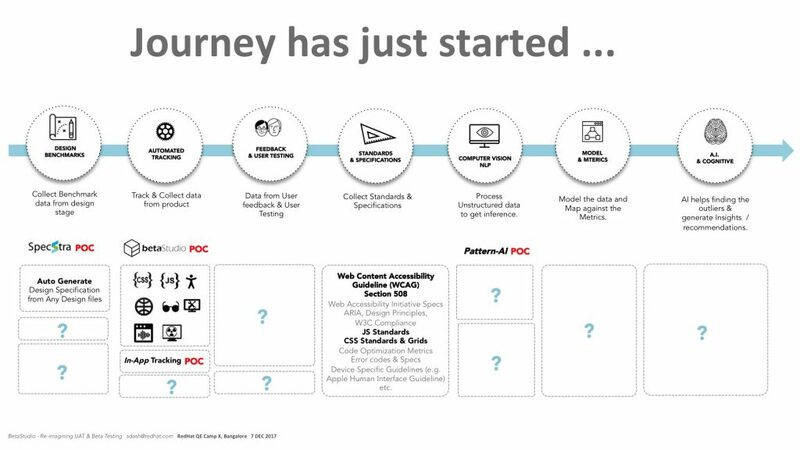 The final step is to build the cognitive unit that can compare the data and apply the correct models and metrics to carry out the filtering of the data and generate the insights which can be shared as actionable output to the end-user/customer. While experimenting for BetaStudio, I have explored different aspects and built some bare bone POCs. 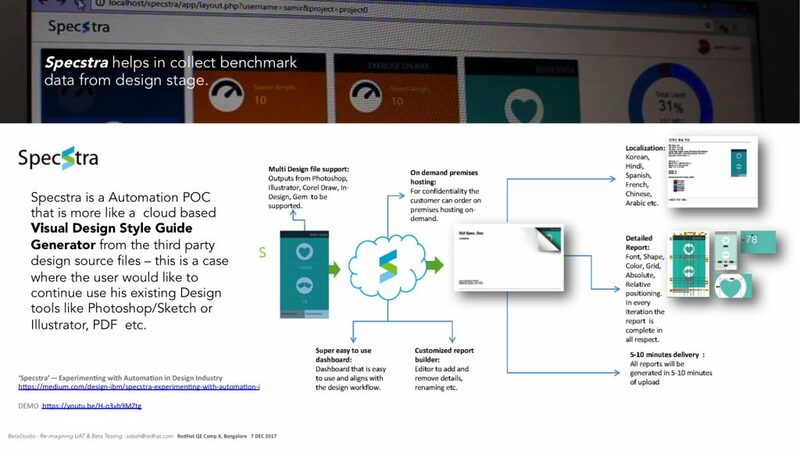 For example, Specstra is a component that can help create Design benchmark from design files. With Specstra I was trying to address the issues related to the cosmetic aspect or visual look and feel. 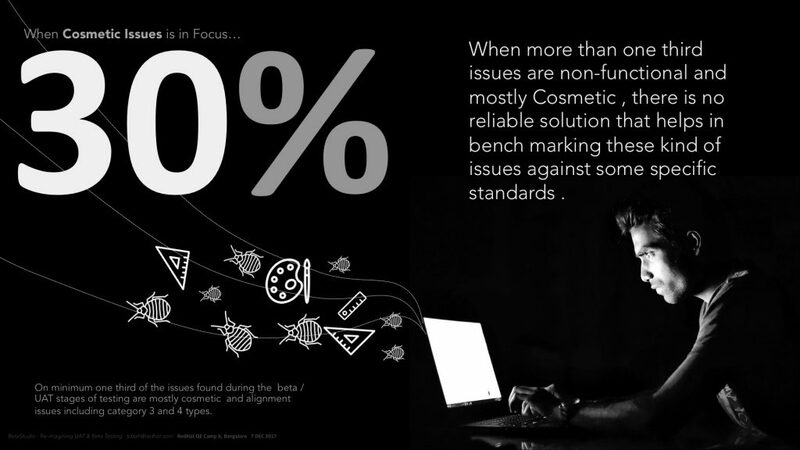 Typically when it comes to cosmetic issues, more than 30% are non-functional and mostly cosmetic. There is no reliable solution that helps in benchmarking these kind of issues against specific standards. One third of the issues found during the beta / UAT stages of testing are mostly cosmetic and alignment issues, including category 3 and 4 types. And these happen mostly because the two persona’s involved (developer and designer) have their own boundaries defined by a mythical fine line. When a developer is in focus, roughly 45% of them are not aware of all the design principles employed or the heuristics of UX to be employed. 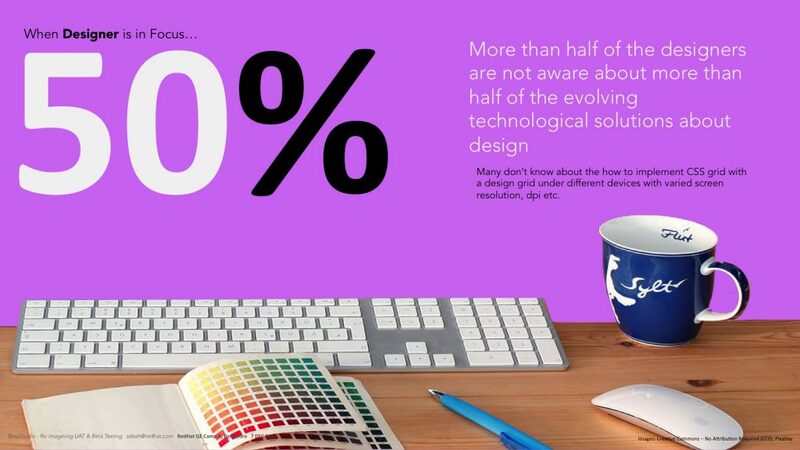 Similarly, half of the designers are not aware of more than half of the evolving technological solutions about design. And in 70% of the of the projects, we do not get detailed design specs to benchmark with. Detailing out a spec for design comes with a cost and required skills. In more than two-thirds of the cases of development there is the absence of detailed design with specs. Many of the designs are not standardized and most of them do not have clear and detailed specs. 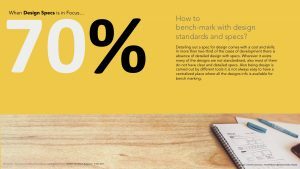 Design is carried out by different tools so it is not always easy to have a centralized place where all the designs info is available for benchmarking. Specstra comes in handy to solve this. It is an Automation POC that is more like a cloud-based Visual Design Style Guide Generator from the third party design source files. This is a case where the user would like to continue using his existing Design tools like Photoshop/Sketch or Illustrator, PDF etc.. I understand that reaching the goal of an ideal beta testing solution might require effort and will likely evolve over time. Rest assured, the journey has started for all of us to connect and explore how to make it a reality. 1. Implementing DesOps is to follow service design methodologies. In reality, DesOps is the most evolved service design methodology, that touches upon all the different roles involved in a product lifecycle starting from conceptualization till the point product being used by the consumers. Therefore, DesOps implementation should establish the best practices for designing services according to both the needs of customers and the competencies and capabilities of service providers. Ensure the requirements are fed into the DevOps cycle through feedback loop seamlessly so that the adjustment of the requirements can be done based on the feedback loop in the design stage that is also iterative and in the agile sprint loops. The requirements formulation is one of the core activities of design.And the requirements should be able to adjust based on the feedback that typically comes from means that cut across design as well as the development -test-deployment-production stages. So it involves the feedback from the large part of the delivery-deployment track, which is fundamentally DevOps impacted process areas. And when continuous integration and delivery (CI & CD) are part of the DevOps implementation, the continuous feedbacks that pours from various stages of DevOps should be addressed in an agile as well as iterative design stage, where these feedback fuel the design decisions to adjust requirements ignorer to meet the user as well as market needs. It is therefore critical that the DesOps implementation must follow the principle of completing the full circle of feedback loop that would cut across both designs as well as the dev-deploy-production stages – i.e. the complete SDLC and use it as an input for Design. Many decisions are taken for a product based on the experience and the gut-feel of the stakeholders that impacts the product. The design – the creative problem solving – gets impacted by this as in real world, design decisions are always biased by the stakeholder’s view of the product and the market. A true DesOps should enable the stakeholder to take decisions based on a more data-driven way. Typical A/B testing, Hypothesis-Driven Development approach and analytics-driven decision making always help the stakeholder to evaluate the options and it guides him to take the more pragmatic decisions by reducing his baseness from his pre-conceptualised version of the product, user, and market. True DesOps, aspires to a world where decisions are taken by validating the data against the postulates that impacts the design as well as the success of the product itself in the hands of users and market. When we broadly speak about design, we do mean the core essence that is about creative problem solving which transcends beyond the typical professional design practices such as social context and business. Because of this, the Design Thinking strategies as solution-focused thinking fuels innovation and in today’s world, it is a popular approach that is employed in communities and organizations. However, in many angles, all these versions of Design Thinking fail flat to impact the final deliverable products in a quick paced agile environment powered by continuous integration and delivery track. The workshops of such Design Thinking sessions do provide innovative outputs, but when it comes to implementations, the sync between these and the final MVP that goes out of the delivery track, is lost and in most of the cases the stakeholders feel that despite the investment into the design thinking approaches, the expected level of outcome in delivery is not met and in many cases changes in requirement in the middle, too many iterations leading to over budgeting, mismatch of skill set and resources requirements to the initial planning work and the feasibility aspects were blamed for the inferior quality of delivery in contrast to the grand outcome from the Design Thinking. Some years back, I was part of a large UX team of a Software Conglomerate, where I practiced their version of the Design Thinking framework. And during many workshops with major customers, and also from casual discussions with some of the stakeholders and Design Thinking practicenors, I realised that though many of our design thinking workshops were successful and were received by the clients with excitement and sense of achievement, this in many cases died down after a few months of implementation happened over fast paced agile delivery modes, as the translation of the great solutions that came out from the design thinking sessions, didn’t actually live up to the expectations due to too many changes in requirements happened because of feasibility, resource management, technology and similar issues. For me, the takeaway from there was that in fast-paced delivery track, the feedback loop must be connected across the design stages to be reviewed at the same pace to ensure that the overall speed of the delivery with quality remains intact. In many cases, because of the fact the issues that popped up during the implementation stages, were never efficiently part of the Design Thinking sessions of the next iteration or design cycle that runs, it was not effective in coming out more practical and pragmatic design solutions and make the necessary adjustments to the requirements. And in such cases the DevOps even when efficiently implemented, the lagging and relatively slow churning-outs from the Design Thinkings, the overall delivery gets impacted thereby resulting into inferior quality MVP than that of the envisioned one. As the Design and Development are two wheels of the bicycle that the product is riding on, even if the Dev wheel is made efficient by implementing the best possible DevOps, the overall pace and efficiency of the cycle is reduced and is equal to the other lagging wheel i.e. Design. To overcome this, one of the core principles of DesOps is to empower Design Thinking to make it more efficient in a fast-paced DevOps enabled delivery process, thereby making it the best fit case for the organizations to adopt. All “Lean” models typically focus on reducing waste in a process by removing it from the value chain of the usability process. One of the key goals of DesOps is about taking proactive measures in reducing waste and fundamentally support tries to bring the practical implementations of it. Therefore, DesOps, at the core advocates, Lean philosophies like that we see in Lean UX models. Along with the fact that Lean UX itself is based on 3 basic principles like “Design Thinking”, “Agile Software Development” and “Lean Startup methods” like “build – measure – learn”, it is an organic part of in DesOps philosophies. Business objectives of the Product. As DesOps advocates LeanUX, it inherits one key attributes from Lean UX, which is about cross-functional team-play. Typically the Lean UX advocates that specialists from various disciplines should come together to co-create the product. Such team traditionally comprises of roles in software engineering, product management, interaction design, visual design, content strategy, marketing and quality assurance or testing disciplines. DesOps fundamentally enables this in bring these diverse roles to the same page and improves productivity through improving feedback loop and communication and providing a train of outcomes of the product development track that helps in “continuous discovery” and validation of product requirements and ideas. 8. Technology decisions should be guided by lowering the boundaries between roles and automation to reduce waste and repetitive jobs that work for the product and project. Perhaps the biggest visible attribute of DesOps is the technology aspect, and the basic principle around technology is about the technology decision making. This is one of the most critical and impacting principles, as the right decision making for choosing the correct technology that will enable or help implement the most effective DesOps for the target organization/team. As DesOps involves the workflows, that touches the different aspects of Software Development Life Cycle and as the goal of DesOps is to achieve scale, the tracking, and traceability of workflows and responsibilities involved from different team members, technology, and tools employed to make it possible are carefully selected to meet the specific design culture that was redesigned with the re-engineered processes and workflows. Employment of automation, machine learning, and artificial intelligence plays a key role in the context of the technology selection to aid the DesOps implementation as well as improving the case for it to play a complementary role for DevOps to make the full-circle. We will elaborate on this aspect in details in coming article of the series. Optimised and re-designed processes are key to reduce waste and remove repetition, At the same time lower boundaries between roles. Broadly the processes that are redesigned in a DesOps implementation include strategy and workflows for reducing wastage. Any repetitive blocks are removed or replaced with the ones that provide quick turnaround time for design deliverables as well as the access to all-around feedback -loops across the lifecycle including development, deployment areas. The goals of improvement of processes also include lowering boundary among different roles to enable a cross-functional team to quickly iterate and produce design outputs which can be fed into DevOps thread in the cycle. Also, process improvements include automation focus along with workflows for traceability and tracking and preparing benchmark data and validating the feedbacks and product performance against them in a seamless way. Also, alongside the focus of the process redesign as part of DesOps include the areas to customize and complement workflows to the existing SDLC if required, that is in the process where possible e.g. Agile, Iterative and Lean models. 10. Enable reviews based on data-driven benchmarks. 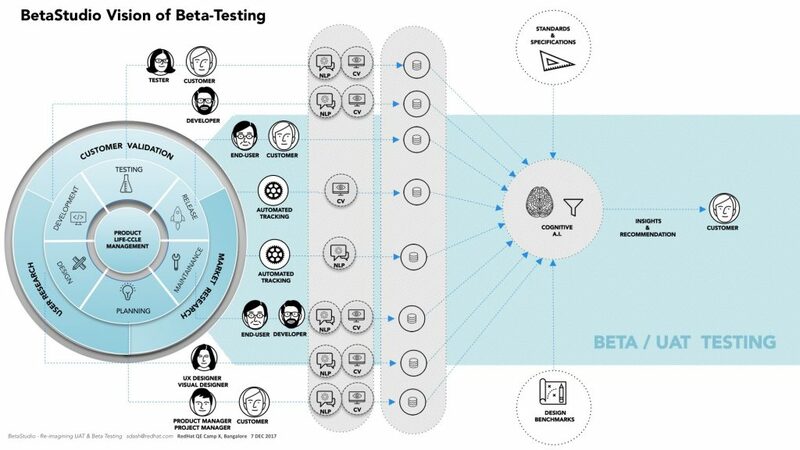 The above diagram shows the high-level vision of BetaStudio that used benchmarking of design aspects which were used at a later stage (mostly the track covered by DevOps) to validate the feedback most of which were generated by automation. In later articles, I will be elaborating on this aspect in details. 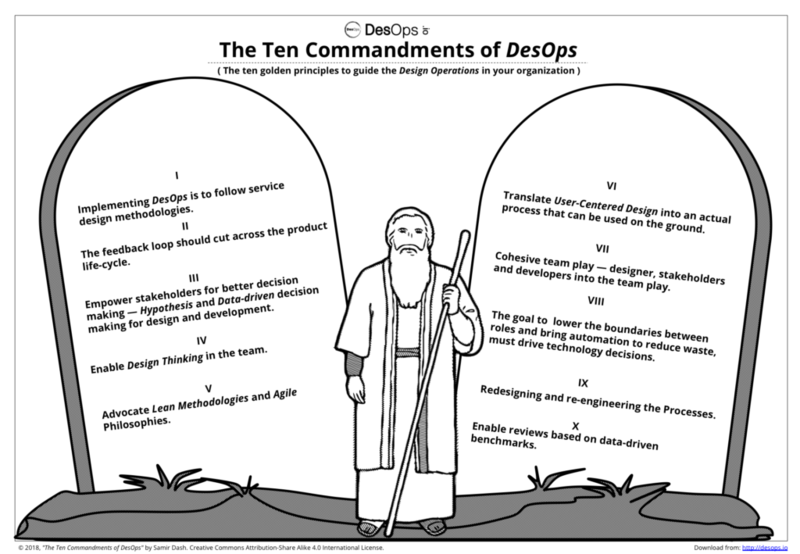 While implementing DesOps in the organization if we contradict any of these principles, it would result in a half-baked design operation that would not help in achieving the goal. In one of the organizations I was part of in recent past, some attempts were made to improve the design process. And in the effort to make the design team’s activities streamlined, certain design tools licenses were bought and the team members are asked to follow certain fixed process and semi-automation plugins etc. Along with this an earlier design system was revamped to provide commonly used patterns and widgets to be used. In the name of improving the process Agile model was cut-pasted and was followed. But over the period it was noticed that the overall efficiency dropped in the team. The interesting part was even though the steps to improve the design work culture implemented some of the key principles we discussed, and missed many, which led to a failed process re-engineering. The whole agile process implemented was designed to make the design teamwork as a separate entity to match the organization structure of the team as a separate business unit in order to ensure easy budgeting and determine responsibilities of the team across multiple projects running. If we review this case, we can find that the putting the design team’s own process delivery cycle didn’t contribute to the overall product delivery cycle. It conflicted with the DesOps principles like Cohesive Team-play and supporting Lean model which advocated the arching DesOps should encompass and cut-across all the teams responsible for the product and not just the design team. Also making design team as a single entity, put it into a silo because of which the feedback loop was not effective, thereby it impacted the translation of UCD philosophies. Well, we will elaborate on similar cases in upcoming articles of this series sometime later. Now as we covered principles, let’s see in the next article, what are the practices that contribute to an idea DesOps. Hope you enjoyed the DesOps journey! No modern-day software design workflow can be discussed without reference to Design Systems. The Design Systems are one of the integral components of any product organisation who are moving at the pace powered by digitalisation. By definition, a Design System is a series of components that can be reused in different combinations to manage design at scale. In the context of software development lifecycle specific to digital products e.g. apps, applications and websites etc., the design system can contain design guidelines, visual style guidelines, assets, components, widget definitions, form controls, interaction paradigm definitions etc. at a different maturity level touching upon different roles starting from the interaction designer, visual designer to prototyper as well as the developer. Many organizations have the pattern libraries clubbed with some best practices and guidelines used as a Design System for the organization and the community– for example is one such example is RedHat’s PatternFly. When you visit PatternFly website, you find it a typical design system that has different components including interaction paradigms, widgets, working code, visual style guides and assets touching upon many roles involved in the delivery thread. Similar is the case with lot other popular design systems. 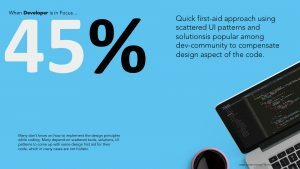 Among popular Design Systems as of today, most notable are: Google’s Material Design, BBC’s Gel, SalesForce’s Lightning, AirBnB‘s Design Language , IBM’s NorthStar and so on. To normalise practices and design patterns around a common visual language, style guides, pattern libraries, design systems play a critical role. Design systems can vary in maturity. With purpose, I have mentioned the case of “different maturity” — it means that the variations of the concept of the design system are already in place, and each of those variations has a slightly different efficiency to solve the common goal of designing at scale. at the bare minimum level, it can simply start with naming objects, colours, texts, components and conventions or even best practices. This can scale up to highest maturity level, where it can define finer details of the experience and even can end up in generative solutions in themselves — e.g. frameworks which may dynamically provide or define the experience details required for delivery. Design Systems have been so popularised, they are arguably a default need of any product organisation of even limited scale. This usually becomes the very first push by an organisation to begin looking at their design operations with fresh eyes as introducing a design system brings with it a whole set of new problems that most digital product design organisations were previously ill-equipped to deal with on their own. The success of the implementation of a design system will ride on the support it gets operationally. No doubt, Design Systems are a primary need for the organisation even on a limited scale and budget. However, the design systems mostly are developed within the operational vacuums. Have the best-designed components, but if you can’t create a workflow for their upkeep and deployment not just through your product offerings, but through your design production system itself, it will invariably cause more friction than the previous system did. Why We Need Design Systems? By nature, a Design System helps taking decisions faster and reduce wastage in delivery track. This thereby helps the designers to spend more time in defining workflows. Also as it helps to work in a fast track mode, it also promotes the designers in exploring multiple concepts in the same amount of time. Having a Design System is to have a “single-source-of-truth“, which can be referred by all different roles including engineering, testing as well as designers throughout the delivery lifecycle. This helps in articulating as well as implementing consistency across different modules of the application or even in the product line. However to ensure the Design System acts as a “single-source-of-truth“, certain criteria need to be fulfilled – and this is also the crossroad where a Design System that acts as the “single-source-of-truth“, paves way for DesOps. Let’s first understand what do we really mean when we refer Design System as “Single-Source-of-Truth”. In the enterprise, any design on the hindsight has one major alignment – i.e. to align itself to the business goals or the enterprise, which also drives the product strategy as well as the delivery and impacts a lot of associated aspects such as the delivery life cycle that includes the typical Design, Development and Quality tracks. In most of the cases the associated operational systems which are made up of processes, practises and tools are mostly development centric. The traditional SDLC models were designed more from a process perspective that had the bias towards development aspect of the delivery. So when a Design system is typically established in an organisation, the normal tendency is to create a Design System that fills the gap between these different entities and their associated process blocks. The Design System that touches all these associated entities and the process blocks in a way that helps in optimizing the delivery of the product or in improving the quality of it, by becoming the single driving force of design aspect (from the creative problem-solving aspect ), can be regarded as a “Single-Source-of-Truth”. But in reality, as the different roles like the Designer, Developers and Quality Assurance team members, each play within their boundary of the age-old definition of processes. The tools, technologies as well as the processes used by them are so diverse and the workflow among them so disjointed that on the ground reality, that having a Design System as “Single-Source-of-Truth” has not been an easy thing to achieve. One of the key aspects is that in modern time with the use of Agile along with design-driven practices like Design Thinking and User Centred Design models, has tried to reduce the tilt toward the engineering, has certainly helped many organisation to be more effective in delivering products with the qualitative design. 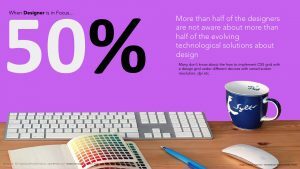 However, the Design System developed in many organisations by nature involves the set of tools and processes that suffer from such bias and the selection of tools and technology-driven workflows that are more developer-centric. For example, the tools like TextEdit or Notepad and the command line terminal windows are highly preferred by the developers. The workflows defined around such tools to make developers more productive and help them improve their craft which is coding. When the processes and tools by themselves are technology driven and developer driven, and when such system is integrated with the standard components of a design system like style guides, codes, widgets etc. , the generation and maintainability of such things by designer gets affected as they are from the different world with their own way of working with their own world of GUI driven tools starting from mind mapping to wireframing and creating visual assets. And this is what brings the disjoint experiences to the design operations, thereby preventing to achieve a seamless full-circle of design-development operations. The result of such Design System is always like a patchwork that may not introduce the fundamental changes in the process to meet the goal of DesOps — most of which are centred around consistency, collaboration, continuous integration and continuous design. And to achieve this is actually a goal that aligns with the core vision of DesOps. 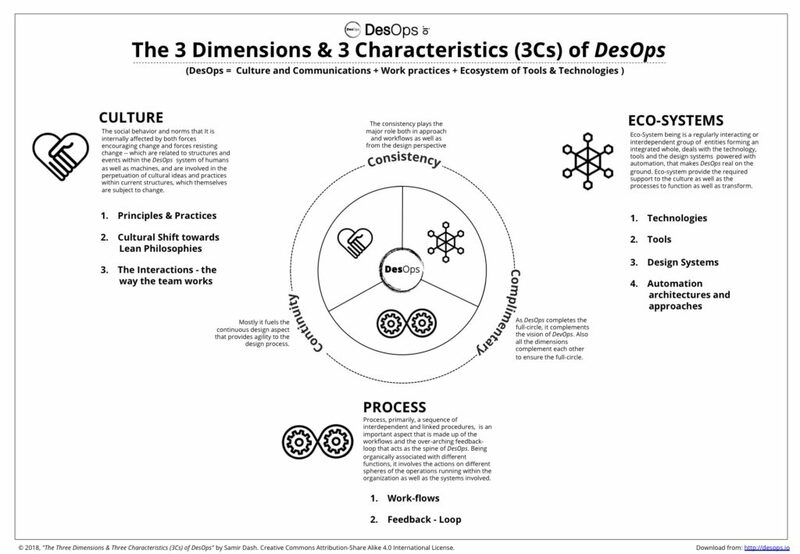 We will continue exploring the Design Systems in context with DesOps and touch upon topics like Design System maturity and Living Design System as well as the concept of generative systems, in the part -3 of this DesOps article series. So keep tuned in and do feel free to share the word!!! 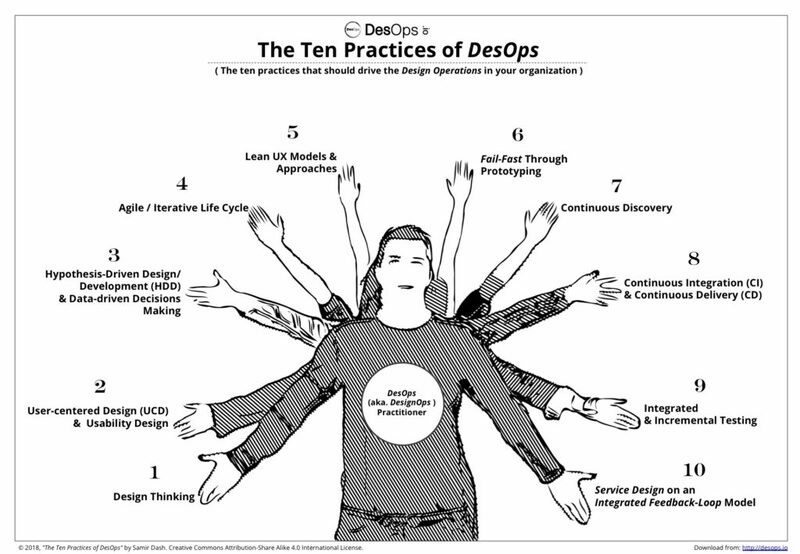 DesignOps or DesOps is an approach to design, inspired by the culture of DevOps. In this article series, we will be touching upon the practical approaches on how to prepare for this next-wave in design that compliments DevOps in the concepts of a cultural shift, collaboration and automation. We will also see what are the available solutions today that contribute to bringing the full circle of design in the context of software development lifecycle. In today’s world, while design as a discipline is getting more and more recognition across the entrepreneur world and many industry efforts like IBM Design Thinking and similar frameworks, trying to create a synergy between the Agile approach of SDLC and the Design Thinking. It is an interesting crossroad in time where the next big thing in product delivery is to bring scalability as well as automation to the creative process. In the context of the Software industry, I always see “Design” as an intersection between creativity and the technology where both shape each with the help from user-needs and blending of these results into successful products. Any typical software product delivered involves many complex as well as diverting technologies, processes, people and visions. Though mostly a software delivery happens with the team members decided in two major groups – developers and designers, ultimately the best outcome always depends on the fact that how these two teams communicate with each other and how efficiently the thoughts and ideas are shared, propagated and translated. When it comes to product development, the amount of complexity and the variety of aspects starting from the diversified thinkings, technology, tools and processes that go into it, is significant. Attempts have been made over the period to improve various aspects of it ensure the delivery process can be optimised to scale upto the ever-expanding needs. In software and IT infrastructure industry, recently one such phenomenon was DevOps that focused on rethinking the development and operations to improve productivity and efficiency. DevOps started in the industry towards the last part of the first-decade post-millennium. Back in 2008, there was a fine separation between the roles who code and the roles who deploy them. Basically, the coders or the programmers were responsible with code generation while the infrastructure guys were looking after the process of deploying them. Due to the rise of Agile process, this code generation and deployment as a part of delivery became more frequent and continuous unlike the age-old waterfall model, when it used to happen every 6 months or a year. In all major software services industry, it was common to have fixed calendar dates in the year that represented the release or deployments. The 2-3 weeks sprints of Agile approach made it obsolete in many. As the continuous delivery became the defacto standard, this narrowed down the gap between the development team and infrastructure team. This also gave rise to the need of multidisciplinary roles or individuals who can bridge the gap between the production environment and the development server, allowing their code to be deployed in a more efficient way and faster. As the DevOps took shape, the practices around it grew from a few talented hackers to a profession with a culture of its own involving its own set of tools, practices, technologies and workflows which became the norm in the industry today. Most of the DevOps today focuses on the process blocks mostly impacted Engineering or technical aspects of the product rather than the design aspect. To bridge that gap, in recent times many attempts are being made to define a consistent approach called DesOps. The DesOps or DesignOps is a relatively new term. Many, to comprehend better, refer to DevOps, which has the prominent similar underlying philosophies and goals. 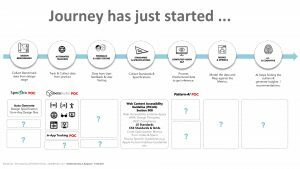 Design operations (aka DesignOps ) is though relatively new concept yet is a growing area of concern for design teams seeking to help their teams increase the value they produce for their host organizations and that organization’s customers. The term and the practices exist inconsistently in many attempts made by different organisations since many years. Even when we try to implement a DevOps geared process to run a Design driven process model, still the actual challenges, the gaps between the design and development or the design and testing blocks are not fixed. So without implementing a DesOps or DesignOpsto fix the design and other endpoint blocks in the process, the implementation of DevOps will never yield the desired outcome and will not be able to sustain the core philosophies behind it. DesOps and DevOps both are complementary to each other. The Design delivery process improvements try to optimise the overall delivery process and thereby contributing to the DevOps. For example the aspects such as testing of the product that involves design aspects, usability, accessibility etc. In the testing phase needs some benchmark to referee to that can only come from a process where the DesOps has implemented that outputs and feeds the benchmark to the DevOps phase where the testing block can use it. In addition to this when we are in Agile or iterative and continuous process models, at each sprint cycle the end to end flow is executed and thereby making the Continous Integration(CI) and Continous Delivery (CD) truly meaningful. DesOps, was primarily born out of the primary need of how to design at scale. The factors that shaped it are of similar nature that shaped DevOps. With the new age software delivery in recent times, with the Agile process and Continuous Integration and Deployment of code, the DevOps approach provided a faster highway to ensure faster delivery with low risks. So the earlier SDLC model got redefined over the period with Agile and Then the DevOps to its current shape. However, as the design was an integral part of any product delivered, the necessity to ensure the gaps between traditional design life cycle working along with the fast track of development life cycle using DevOps are bridged. The need for tighter integration between the design team and the engineering team became a necessity to ensure to design at scale. During recent two-three years, the top five big companies heavy investments into this area pave the way for other organisations and design communities to be more explorative in this area. The implications of DesOps is reflected in the outcome, where the silos among the teams and disciplines get reduced. Along with this, it improves the collaboration among cross-functional team and working practices, that contributes to minimising wastage in the delivery process. Keep tuned in… next, we will start explorations with the basic blocks for DesOps – i.e. the Design Systems.